Isagenix Shakes - Buy Isagenix IsaLean Shakes at the Best Prices! The Best Meal Replacement Shake on the Market! Isagenix IsaLean Shakes pack 24 grams of protein per serving (if you want shakes with a higher protein content try the IsaLean Pro Shakes). They also contain 8g of dietary fibre content that will keep you feeling fuller for longer. You can’t go wrong with these delicious shakes. Each 240 calorie shake is ideal as a meal replacement. It’s clinically shown to support healthy weight loss and lean muscle growth. Isagenix IsaLean Shakes also include 23 different vitamin and minerals for optimal health. Isagenix IsaLean Shakes are gluten free and soy free while being packed full of high density nutrients – get the best of both worlds! 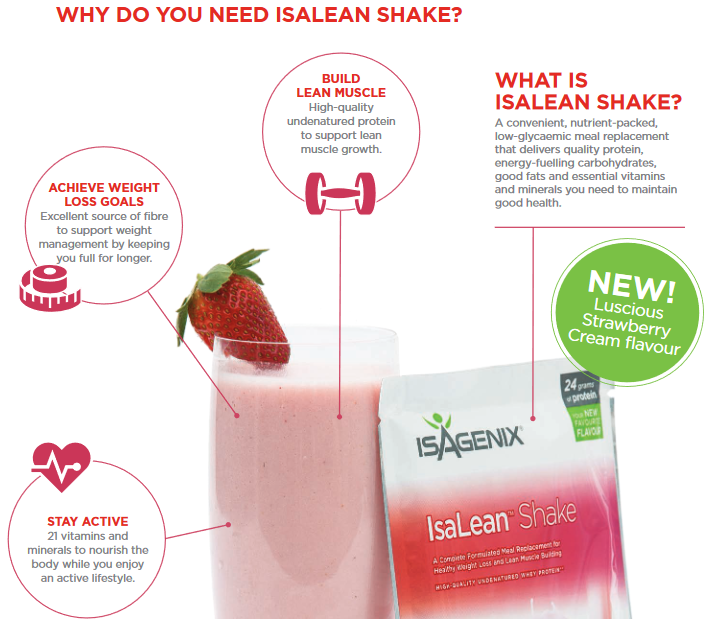 Isagenix IsaLean Shakes are available in delicious flavors including Creamy French Vanilla, Strawberry Cream and Creamy Dutch Chocolate (which can be chosen at checkout). There is also a dairy free option. What are the Ingredients in Isagenix Shakes? Because the list of ingredients differ per flavour, please click on the Buy Now button above or below. On the next page you’ll be able to view ingredients by flavour. For more information about Isagenix Shakes or any of the other Isagenix products, contact Nicole at info@isaelite.com.au or call her on 0413 254 398. You can purchase IsaLean Shakes at full retail price if you prefer not to sign up and take advantage of the wholesale prices. Remember, if you are not completely satisfied with your products you can send them back for a full product refund. All products for your first order are covered by a 30 day money back guarantee, you have nothing to lose but body weight! Full details can be found here.